Sam Brown’s long-anticipated book has been well worth the wait. 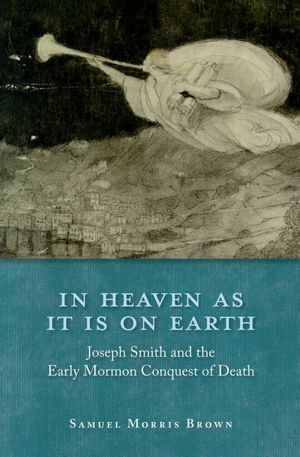 Officially billed as a study of Joseph Smith’s (and early Mormonism’s) preoccupation with death and dying, one of the book’s most signature contributions is the clarity with which it illustrates that Mormonism was born in a different world than most of us take for granted today, a world in which death was simply omnipresent in ways with which the modern world has provided blissful unfamiliarity. Mormonism is a late-pre-modern religion that has managed to survive the transition and take root on modern soil. And while this fact has furnished rich analytical and theoretical material for historians and social scientists of Mormonism to work with in crafting their master narratives of the faith, Sam’s work here reminds us that, much more than metaphysics and selfs or even technologies and secularities, the pre-modern/modern distinction is grounded in a brute and elemental fact: pre-modern people encountered and experienced death as something that frankly eludes the modern imagination. This is an early contribution to what will undoubtedly be a prolific corpus of the book, and I wish to make a few key observations about Sam’s work en route to my overall evaluation. In the interests of consumer protection, I feel I should include a disclaimer here: not only is Sam a good and valued friend, but my own strong preference for high quality, innovative, analytically rich scholarship and awesomeness in general has surely influenced my overall reaction to the book. The book is divided into two parts, “Death, Dying, and the Dead,” and “Everlasting Communities.” Each of these is subdivided into chapters with provocative titles like “Joseph Smith and Holy Dying,” “The Corpse and Its Rest,” “Seerhood, Pure Language, and the Silence of the Grave,” and “Divine Anthropology: Translating the Superhuman Chain.” Part one sets the stage, in rich and granular ethnographic detail, for Part 2 by describing early Mormon (by way of early Antebellum) death culture. His description and analysis of bereavement and deathbed scenes, attitudes toward and handling of corpses, and treasure hunting and grave relics establishes the central place of death and dying in the lives first generation Mormons, including and especially Joseph Smith and his family. Among other purposes and effects, Smith’s religious mission, even in its earliest stages, confronted and challenged the power of death by giving voice to the dead (and often long and forgotten dead), and overturning the devastating and dark silence of the grave. The second part of the book deals more directly (in part because it covers the later developments of the Mormon Restoration) with death conquest in its fullest Mormon expression. It traces an arc beginning with the pentecostal outpourings and communal effervescence of the establishment of early temple rites in Kirtland, through the genealogical reformations which Sam ties to the “Great Chain of Being,” and culminating in the establishment of a paramasonic ceremonial corpus in Nauvoo that formally tied the implications of Smith’s divine anthropology to an emerging human-divine kinship structure characterized by sacramental adoption and plural (celestial) marriage. In Smith’s emerging (and emergent) vision, incorporation into the body of Christ is incorporation into the family of Christ, and imitatio Christi is an ontological rather than merely devotional phenomenon grounded in the conspecificity of gods, angels, and human beings. A vision of Joseph Smith emerges here, of a prophet whose revelation not only drew from the cultural and religious landscape of the post-Colonial American frontier but translated the language and grammar found there into something new, something that made the Revelation legible, allowed it to speak itself to the world: prophet qua translator and artist, rather than medium or collator. Sam’s insights about translation are especially valuable. Joseph Smith was a translator, and translation applied to more than languages or cultures. Beings were translated, individually (as Elijah) and collectively (as the people of Enoch). Smith, as prophet, seer, and translator, sought, through his restorative instrumentality, to effect the translation of individuals, families, extended families, communities, nations, and the whole of humanity. This was a power conferred upon him (as it had been on his occasional namesake, Enoch) by the translated being par excellence: Elijah. Another noteworthy contribution here to our understanding of early Mormonism is Sam’s focus on the person of William W. Phelps and his influence on how Smith’s vision took concrete shape. Among other things, attention to Phelps’ contributions demonstrates that much of what is typically cast under the heading “Nauvoo Mormonism” or “Nauvoo innovations” was already present in at least nascent but recognizable form much earlier in Smith’s prophetic career. Repatriation of Phelps into the elite club of influential thinkers and systematizers of Smith’s ideas (a circle dominated in our historical memory by the Pratt brothers) adds important dimension to the story of the Restoration. Much ink, real and electronic, has been spilled in Mormon studies over striking the proper balance and tone in academic descriptions of Mormonism. We talk endlessly about how we talk about things, about balancing faith and reason, devotion and scholarship, promoting faith and maintaining academic integrity. Sometimes we talk about how hard these things are to balance, and sometimes we talk as if they don’t require formal balancing at all, as if simply telling the straightforward story will meet all requirements on either side. Sam’s book speaks to these questions in groundbreaking ways. It certainly raises and sets the standard for balance, so much so that I’m tempted to suggest that Sam’s voice transcends the tonal polarities we usually find so vexing in ways that the work of Bushman, Shipps, et al, only really approximate. I’m tempted to say this because this book is at once the most flagrantly honest, detailed, unflinching, and analytically rigorous examination of early Mormonism while simultaneously affecting a prosaic tone and voice that (while moderately but pleasantly idiosyncratic) constitutes the most invigorating and generous description of Joseph Smith’s thought I have ever encountered. Moreover (and rather in spite of Sam’s professed allergy to most social theory), the book makes clear that a vigorous and self-conscious theoretical frame is vital to the enterprise of historical reconstruction. At the same time it demonstrates that aggressive theorizing doesn’t have to render an illegibly convoluted analysis. Notwithstanding, for example, an avowed disdain for Bourdieu, Sam has written a book the French theorist would have loved, would possibly have tried to claim a share of credit for, and whose elegant and engaging prose Bourdieu would have secretly envied. Before I stop embarrassing Sam by gushing all over his work, one final point. The book, as noted in my opening, presents itself as a topical work of Mormon history, as an examination of a particular focused subtopic—in this case, of early Mormon death culture—rather than a general overview of early Mormonism. And while Sam never explicitly makes this claim, the book in its totality makes a compelling case that its focus is not a side topic (similar to, say, early Mormon attitudes toward diet or music or even sexuality), but rather a core center. Sam’s focus on death, dying, death culture, and death conquest fills a lacuna in Mormon historiography that utterly shifts the ground, presenting in the process something very close to a Grand Unified Theory of Smithian Mormonism. With apologies to all the relevant parties, this is quite simply the best work on early Mormonism yet published. So wait, you liked it then? So wait, you’re saying I should replace the Grant Palmer paperback on my bedside table with this volume? Of course we all know you already replaced Palmer with Connor Boyack’s book the moment your pre- ordered copy arrived. Nonsense. They sit there together, in delicate equipoise, taunting me with the truths of the universe. On a more serious note, I’ve just started Sam’s book, and loved the introduction…. Sounds great and I really like the idea of considering Mormonism in terms of these fundamental issues that occupy people both on a theoretical level but also a very real and practical one. Hopefully this is the start of a trend. Thanks, though–I imagine this is an early (and particularly articulate) entry in the catalog of praise likely to be elicited by the book. Thanks, Brad. I don’t merit these kind words (other than moderately idiosyncratic, which is perfectly accurate), and I’m grateful for your input and friendship. It’s strong work, Sam. Thanks for the write-up, Brad. I look forward to meeting this elegaic JS. Thanks for the review Brad and,more importantly, for the book, Sam. btw, dare I mention Lacan. Thanks, Brad, for the review. I will now go get the book! Aaron, Je ne suis pas un lacanimal. Congrats, Sam. I can’t wait to check it out. Great work, Sam. And Kristine FTW. Does anyone else keep seeing Yoda on the cover?